Some gamers can't just play Pokemon Go the way it was intended to be played. Some people really want to cheat the system without having to go outside or get any kind of exercise. So what are they doing? Well, they're taking advantage of certain household items to cheat. According to the Daily Dot, some gamers are looking to fans to help them cheat the system. Some of Pokemon Go's features rely on travel distances to unlock certain items, such as hatching eggs, which can be collected from around the game world. Players will have to travel several kilometers to hatch those eggs...but it doesn't always mean that they have to manually walk, ride or drive those distances. In some of these cases, gamers are strapping their iPhones or Android devices to ceiling fans or other rotating devices in order to trick the game into thinking that they're traveling. One gamer uploaded a video under an account called "Nintendo, don't ban me" where he explains that he has attached his phone to a small fan, aimed upward and positioned between a desk, the wall and the door. You can see the minute long video below, which is entitled "Most ineffective egg hatcher". He doesn't know if the method will properly work or not or if it will just spin around and make his phone dizzy. The Daily Dot reports that the fan method is catching on with quite a few people but not everyone is having success with that method. Over on Reddit someone made a thread saying "Can confirm, ceiling fan [strategy] does NOT work". 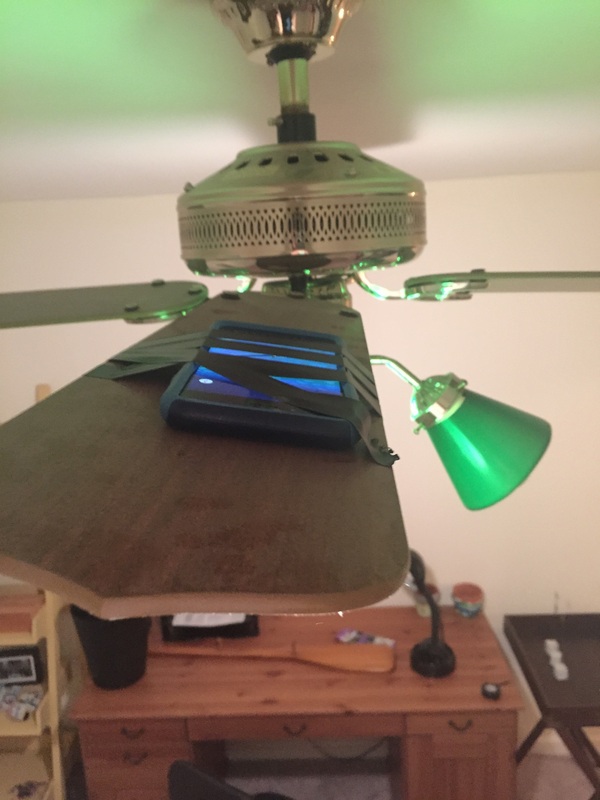 They link to an imgur gallery with their phone taped on top of a ceiling fan, letting the Pokemon Go community know that it doesn't work quite as well as some have said. In the Reddit thread, one person mentions that the pedometer and the GPS within the smartphone devices is what Pokemon Go uses to track distances traveled. In a lot of the cases when attaching the phone to the fan the GPS isn't actually going anywhere. So it's basically just giving the phone a free ride on the fan with the high potentiality that it might break...and yes, some of these phones have broken. The Daily Dot article reports on a couple of cases where people have attached their phones to a fan and things didn't quite turn out the way they way they expected. The phones weren't firmly secured to the fans and as they started picking up speed, the phones took a one way trip to the floor, cracking and breaking in the process. So what's the lesson in all of this? Well, as a lot of people in the Reddit thread pointed out... it's safer and less hazardous to just go outside and walk or ride a bike in order to hatch the eggs in Pokemon Go. Of course, the other way that people have been cheating is using drones to fly their phone around to rack up walking points, but not everyone has access to a drone. It seems like the safest and best way to play Pokemon Go is simply to use it as intended, without the drones, fans or other contraptions that might result in your phone being damaged or broken in the process.